Network switches aren’t always as glamorous as new digital media ventures or startups making spy-grade smart watches, but a small Oakville, Ont.-based firm is winning attention in the telecommunications industry for its unique hardware. Phybridge Inc. just introduced its new network switch PoLRE, which stands for Power over Long Reach Ethernet. To explain what this box does in a nutshell, most offices run their voice over Internet protocol (VoIP) services, but Phybridge’s switch delivers the telephony separately. So even if the office LAN crashes, the phones stay online. 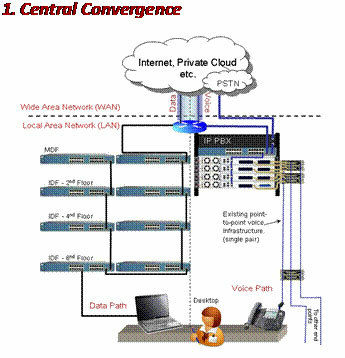 Phybridge uses two-wire Ethernet technology to create a network that provides power over Ethernet, a separate voice path for VoIP, and a data path for local network services and Internet connectivity. The technology also extends four times further than traditional data switches, according to Graham Brown, a spokesperson for Phybridge. Structure of a network using a Phybridge switch. The 13-employee firm founded in 2006 has partnered with some of the biggest communication technology brands around. It serves Mitel as an OEM, and Mitel sells the switch as the StreamLine Switch to a global market. Avaya will also be rewarding its sales staff for moving Phybridge Switches, and will be marketing it through its partner community. Other strategic relationships have been made with carriers such as Verizon, Frontier Network and Bell Canada. Phybridge has received funding from the MaRS Investment Accelerator Fund and is seeking another $5 million round in order to expand to a global market. It has branch offices in Macedonia, Chicago, and Phoenix to start on that initiative. The firm first launched its data switch line with the UniPhyer just over four years ago. It’s deployed 90,000 ports to customers including TransUnion Credit.